Did anyone want more crazy maps? I didn't think so either! Make it stop! 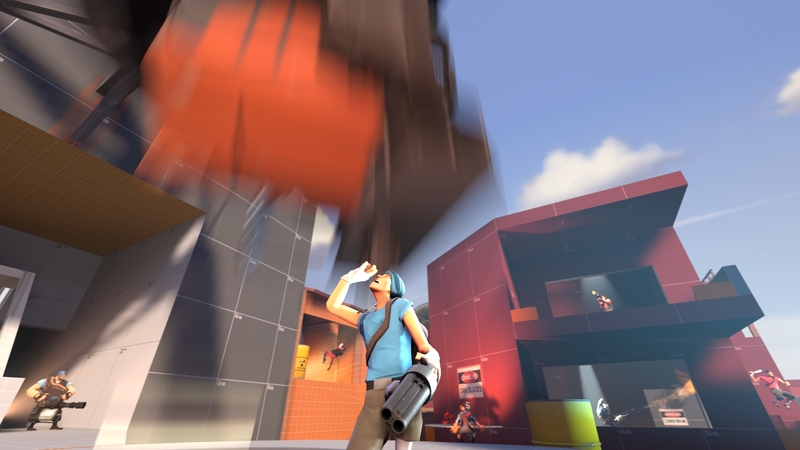 Though it's from the creator of cp_stoneyridge, so it can't be all that bad. TF2Maps.net forum post (with more screenshots). / Download (right-click, save as, 40MB not-compressed-in-BZ2 form). for all you Spoily McSpoilertons out there. I should start suggesting actual maps sometime. Location: Lost, yet totally rocking out to some music. Oh what fresh hell is this. I would like to start a vote that we turn Nom into 24/7 windmilltrainsaw, traingrid and trainsawlaser. So much detail. Ridiculous saws, pumpkin traps, lazors on trains... I think I'm in love. So why haven't we played this map 10 times already? Gameplay of it, just so people know what its like. -Fixed out-of-map exploits. If you DO manage to get out of the map, it will now kill you. Balance has been restored. -Fixed a bug where you could block the spawn courtyard train's gates. This also kills you. -Raised the center point kill counter up higher to fix a few small issues. -Slightly reduced spawn times after capture. -Train Rain now happens on it's own after a set amount of time with no control point captures. The train god himself creator also uploaded this video showing the various iterations of trainsawlaser. Pretty interesting from a mapping point of view. Map has been updated to B3 a few days ago. I spent a good 10 or so minutes killing myself on a train the other day, trying to using one of the out of map exploits. Rather unfortunate that they removed those. I guess from a design point it would be an issue to have those in, but I still enjoy walking around outside of the map. Map's been patched up and the latest is now koth_trainsawlaser_b4fixed, available in the TF2Maps.net forum post, downloadable here (zip format). Quite a bit of new content was added. Beta 6 is up and available. Waiting for Gabe to put it on the server, I s'pose. RC1 is available now. Or RC2? RC1 about a month back.